Shopping is made easy in Vietnam. From tailored suits to hiking bags to coffee and tea, you name it, this country has it. You can buy handmade products in Hanoi, well-tailored suits in Hoi An, fresh or dried flowers in Dalat, seafood in Nha Trang, and a whole lot more in Ho Chi Minh. In this part of Vietnam, you can shop for locally made products or designer goods. The shopping malls carry both local and international brands, where the prices are considered cheaper compared to other countries. Some of the open markets like Ben Tanh Market, Taka Plaza, and Saigon Square are among the popular and most-visited ones. Here is where locals and tourists alike go to buy overruns of different fashion brands, souvenir items, and some handmade products. Aside from the usual shopping malls and open markets, Ho Chi Minh is loaded with flea markets almost every weekend. Try scouting through these five weekend markets when in Saigon to discover unique items at affordable prices. This market was founded by Moon Doan, a media representative/designer/blogger, in 2011. It started as a market with mostly fashion and beauty products being sold. But six years later, it has now become a community of creatives. 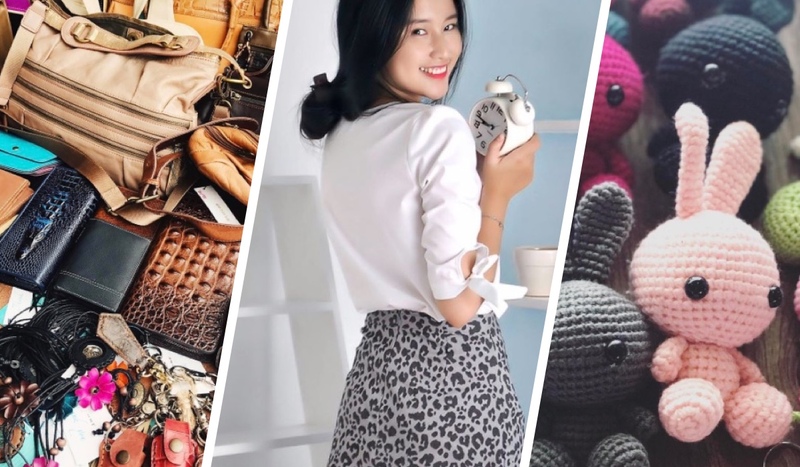 Considered one of the first handmade and vintage flea market in Vietnam, Saigon Flea Market paved the way as an alternative shopping haven for both locals, expats, and travelers. It features different artisans and their one-of-a-kind products. Located in Phu My Hung, a district not many people visit for art or outdoor activities, it has now become a weekend go-to place for art, fashion, and beauty enthusiasts and shoppers. 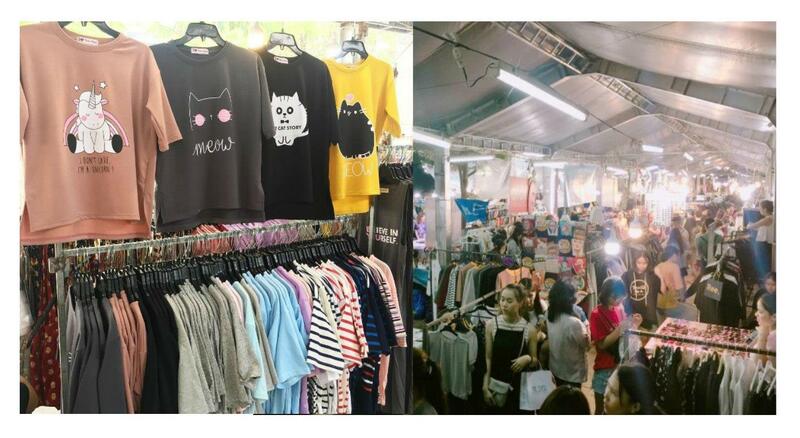 Saigon Flea Market is at Boomerang Restaurant, Crescent Mall, Phu My Hung, District 7 every 1st and 3rd Sunday of the month, and at Riviera Point every 2nd Sunday. It’s open from 11 am to 7 pm. Shopping doesn’t equate to just spending money on a product. It is a full experience: from the products, the customer service, to the atmosphere. This market has just that and more. 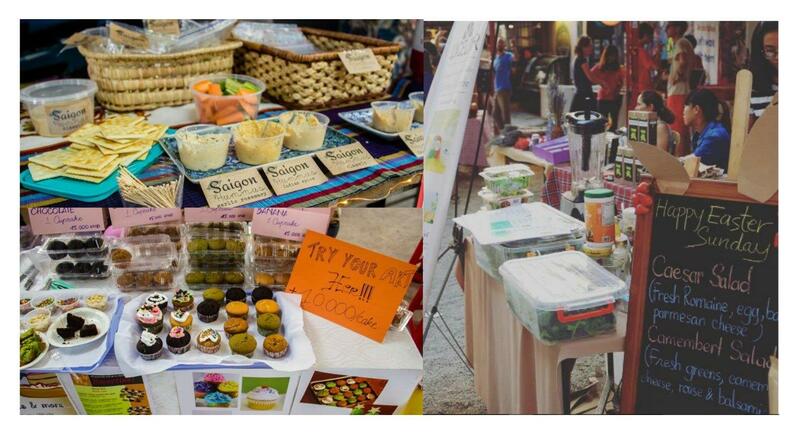 It doesn’t just have a myriad of stalls for clothes, shoes, bags, or beauty products, it also has a number of food stalls. The food stalls offer Vietnamese street foods and foods from other countries to cater to all their customers. They also have live performances to complete the whole shopping experience; they even have famous artists perform at times, which makes the place often packed with people. If you’re up to weaving your way through numerous customers and shopping stalls while being serenaded by performers this market is for you. Hello Weekend Market is held at two places: at Hoa Lu Stadium, 2 Dinh Tien Hoang, District 1, and sometimes at Vietopia, Đường số 9, 02-04, Tân Hưng, Quận 7, Hồ Chí Minh. It is held on the weekend from 9 am to 9 pm. In contrast to its name, this place is completely out of the box. It is a shopping haven for artists and art enthusiasts alike. This market features a lot of local artisans and artists. You can have your portrait done and watch several artists draw or paint their impression of you in just about 20 to 30 minutes. There are a number of stalls for your home as well: paintings, lamps, figurines, photo holders, and a whole lot more. Aside from products, they also offer services for customers like a henna tattoo, nail art, and tarot reading. 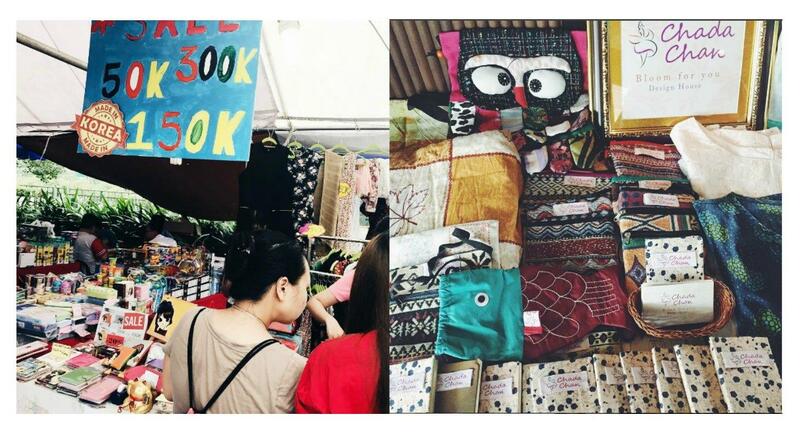 It is a showcase of different crafts.They also have a photo booth area that is decorated differently every week. At times, there are acoustic performances by local singers and performers as well. Go here if you need some items for your closet or your home. The Box Market is held on weekends at two places: at Ho Xuan Huong Sports Center, 2 Ho Xuan Huong, District 3, Ho Chi Minh City (corner ba Huyen Thanh Quan Street), and sometimes at Cung Văn Hóa Lao Động, 55b Nguyễn Thị Minh Khai, Quận 1. It is open from 10 am to 9:30 pm. If you’re up to more adventures, drive a bit farther to District 2 and visit Saigon Outcast. It is a creative space for performances, workshops, music, and other activities, which now include two different kinds of markets. The Farmers Market is for everybody: the home cooks, the foodies, the whole family. It features fresh produce, homemade goods, and some home decors. Just like the other markets mentioned, the farmers market isn’t just a buy and sell event, as it also has some performances and other fun activities for both the adults and kids. It also aims to educate people about our environment, and what healthy eating does to our body. 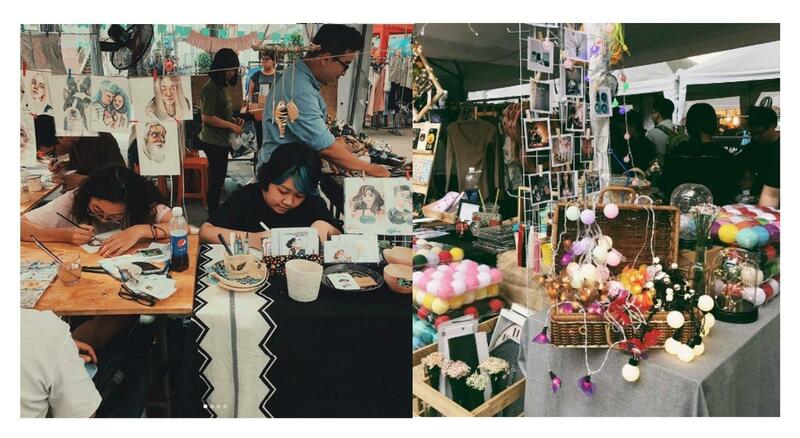 Another good place to look for distinct gift ideas is at Outcast Boho Market. Handmade accessories, boho-chic fashion pieces, and jewelry are a plenty at this market. Despite the number of customers or visitors coming in, it still maintains a laidback vibe, which makes shopping more fun. You can even chat with the makers and get to know the story of their brand. Both The Farmers and Boho Market are held at Saigon Outcast, 188/1 Nguyen Van Huong. Thao Dien, District 2. They are held on a weekend, once a month. There is a fee of 20,000VND to enter, which also includes 1 bottle of water or Red Saigon Beer. With the emergence of social media, it’s now either ‘Instagram or it didn’t happen’ or ref magnets and key chains to prove that you’ve gone to a specific city or country on the map. With this in mind, many travelers head to different malls and shopping places they’ve read online or seen on a vlog to get their hands on their souvenir items. Try and visit one or all of the markets on our list, and get to have a different shopping experience in Saigon.